Isolated spring thundersnows are possible in the afternoon for the next couple days. If accompanied by rain expect increased natural Loose Wet avalanche activity. Observing cumulus clouds building should trigger a flight response to seek shelter. A snowmobile, high-marking a bowl, may be one of the best lightning conductors ever. Soft corn snow that hasn't refrozen at night can be dicey on steep terrain. Sunday the 29th is the last day of snowmobiling. Loose wet avalanche activity may persist through the closing weekend. The sun & warm air temps are contributing to the rapid melting of surface snow. Liquid is percolating through the snowpack & can be seen running along the ground in some areas. The expected rain & thunderstorms will loosen snow grains exponentially, making avalanches almost a certainty. It has been three nights without a refreeze! An isothermal snowpack exists. A fairly homogenous snowpack around 0C & daytime temperatures reaching near 60F degrees has us in springmode. The excellent corn sliding in the morning turns to a slush soon after, constraining backcountry plans. Crusts are deteriorating within the snowpack as melt-water percolates towards the ground. The snow is going fast! Please submit any snowy observations you see, it only takes a moment & you can help spread the knowledge by helping me. The mountains are shedding Loose Wet avalanches at a constant rate. Many of the avalanches are originating from the hot exposed rocks on steep terrain. 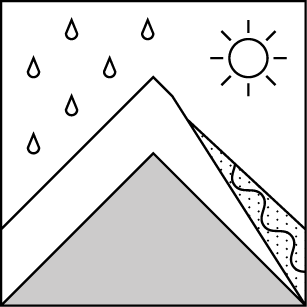 Travelers can easily trigger wet sluffs on slopes steeper than 30 degrees. The push-a-lanche phenomenon has been witnessed while splitboarding in the afternoon heat. Large areas around rocks, trees & bushes are hollow from radiant heat. Be cautious of these tree-wells as they can alter your travel, quickly sucking you into a hole. Some looming cornices are looking as though they want to peel off the ridges. 0600 temperature: 34 deg. F.
Max. temperature in the last 24 hours: 56 deg. F.
Warm temps & light winds. There is an increasing chance for afternoon thundersnows through Thursday. Beyond Thursday the forecast gets crazy again with snow & colder temperatures on the horizon. Small accumulations are expected at higher elevations & winds will increasing with the cumulus build-up. Weather: Sunny. Isolated thunderstorms in the afternoon. Partly cloudy. Isolated showers & thunderstorms late. Partly cloudy. Slight chance of showers & thunderstorms in the afternoon. Temperatures: 56 to 66 deg. F. 36 to 41 deg. F. 59 to 67 deg. F.
Weather: Sunny. Isolated thunderstorms & snow showers in the afternoon. Partly cloudy. Isolated showers & thunderstorms late. Partly cloudy. Slight chance of thunderstorms & snow showers in the afternoon. Temperatures: 49 to 55 deg. F. 32 to 38 deg. F. 51 to 57 deg. F.